The WR series has been discontinued. Please contact our Temperature Engineering department for a viable replacement. The WR Series Room Thermostats are designed to directly control individual heaters or, by using an external contactor, can control several heaters. The WR-90 is particularly useful for maintaining lower temperatures (in garages, warehouses, etc.) and avoiding unnecessary heating costs. Each design has accuracy and provides long reliable service with a 3° control differential. Both units are heavy duty, single stage, with a SPST line voltage snap-action switch and are finished with tough, metallic gray enamel housings. The WR80-EP room thermostat is designed to control individual heaters directly or by using an external contactor to control several heaters. It provides accuracy, long and reliable service. The control is a heavy duty, single stage, SPST line voltage snap-action switch featuring an external, coiled sensing element and adjustable setpoint knob. WARNING: Hazard of Fire. The WR thermostats are designed for temperature control service only. Because they do not fail-safe, they should not be used for temperature limiting duty. °F Maximum Rating (Amps/Watts) Model No. Wt. 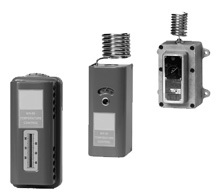 참고: Type WR thermostats are designed for temperature control service only. Because they do not fail safe, they should not be used for temperature limit duty.